Sony 4" flat CRT black and white video door phone w/ 17 picture memory, 2 way video door phone security system. 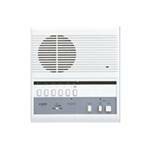 Audio Door chime. Maximum expansion of up to 8 monitors, 2 doorbells and 2 dome cameras. Smart design and simple push button operation. 32 flexible programmable line keys for immediate line or feature access (DSS). 3 lines of LCD information (adjustable) with 24 characters per line 2-color LED per key immediately indicates call status 11 function keys for ease of operation 4 Softkeys. Call/Message indicator lamp Hands-free speakerphone. 12V DC, 300mA per station. *Use PS-12C power supply Subs call in with call tone and LED, 20 sec. Depress station button with lit LED. Press to talk, hands free reply. No LED annunciation between masters. Hands free reply from responding master. *800mW receive at 20ohms. 500mW transmit at 20ohms. 30V DC, 0.1A (resistance load). 12V DC, 300mA. Use shielded multi-conductor wire, not twisted pairs. Siedle public network telephone with monochrome monitor. The perfect switchboard in a table-top version. 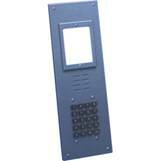 Door telephone for detached or semi-detached house. 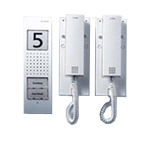 In-house telephones with door releaseand light button. Electronic call differentiation and call silencing. Door station with illuminated info sign and call buttons. Available with custom markings. Made of powder coated 16 guage galvanized steel. Standard sizes.